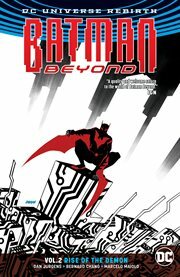 The item Batman beyond, Volume 2, issue 6-12, Rise of the Demon, Dan Jurgens, Steve Orlando, Vita Ayala, writers ; Bernard Chang, Siya Oum Dexter Vines, artists ; Marcelo Maiolo, Tony Aviña, colorists ; Travis Lanham, Dave Sharpe, letterers ; Dave Johnson, collection cover artist, (electronic resource) represents a specific, individual, material embodiment of a distinct intellectual or artistic creation found in Kent District Library. The Batman of the future is back. Emerging from the rubble of the cataclysm that nearly destroyed the Earth, Terry McGinnis has returned to Gotham City and reclaimed the mantle of the Bat. He's fended off some of his deadliest foes to do it. But he's about to face an unexpected enemy-an opponent more patient, and more powerful, than any he's ever known. When the League of Assassins launches an all-out assault on Gotham, Terry must travel to Tibet in his experimental Batsuit. There, he'll stop at nothing to rescue his captured mentor Bruce Wayne and take the fight to their leader-Ra's al Ghul himself. But when he finally gets his audience with the Demon's Head, he's in for the shock of a lifetime. Can Terry defeat this shadowy figure and free Bruce Wayne from his nemesis? Or will this all-out war-and the twisted technology of his biomechanical Batsuit-drive him into a darkness he can never escape? Discover the answer in BATMAN BEYOND VOL. 2: RISE OF THE DEMON, from the creative team of Dan Jurgens and Bernard Chang. It's BATMAN BEYOND and Ra's al Ghul as you've never seen them before!